To be fair, they were dealing with a more fundamental issue: how to convince stakeholders from government, industry and academia to agree on standardized crash test dummies and computer models, necessary first steps in understanding the biomechanics of accidents and lowering the toll of death and injury on U.S. highways. They have made substantial progress. According to the National Highway Traffic Safety Administration, the fatality rate per 100 million vehicle miles traveled decreased 32 percent between 1994 and 2016, the last year statistics are available. Now researchers are beginning to move beyond the consensus choice – the 50th percentile male – to look at other vulnerable populations, and the University of Virginia’s Center for Applied Biomechanics is taking a leading role. Foremost among these groups are women. In 2011, the center’s researchers published a study demonstrating that women wearing seat belts were 47 percent more likely than male seatbelt-wearers to suffer severe injury, even after controlling for age, height, weight and the severity of the crash. The discrepancy is especially pronounced for lower-extremity injuries. Among the many dissimilarities potentially affecting results are different ligament laxity and bone shape. One of Kerrigan’s graduate students, Carolyn Roberts, is focusing on this issue. Roberts is trying to understand the biomechanical differences between males and females and determine how these differences affect injury tolerance. 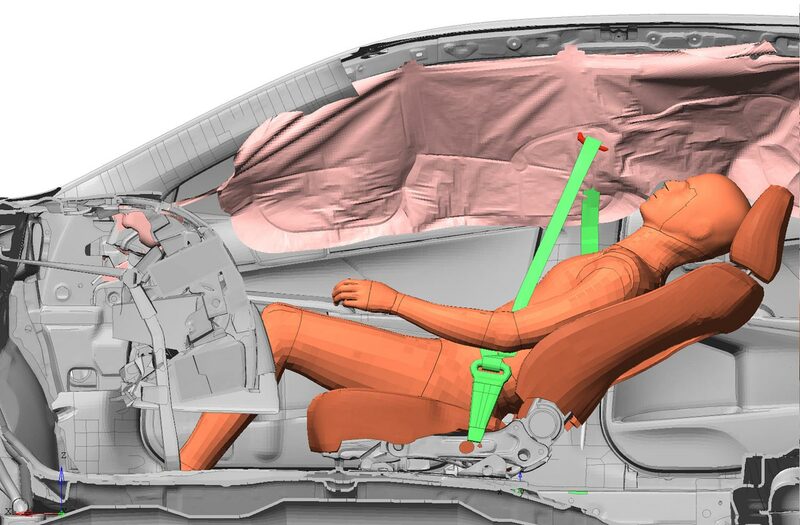 With support from Autoliv, one of the largest makers of airbags and seatbelts, she is determining the precise limitations of the current methodologies used to predict female response and developing a companion dataset of female injury response data. This will enable her to identify specific test conditions where male-to-female prediction techniques fail. She will use her conclusions to develop independent injury models for women as well as to devise ways to extrapolate from male data that are more accurate than geometric scaling. Finally, by comparing male and female models, she will be able to determine which mechanical differences between males and females have the greatest effect on injury. “Hopefully, with increased understanding of injury tolerance and prediction, automotive manufacturers, auto safety policymakers and injury prevention researchers can work together to make vehicles safer for the entire population,” she said. The 50th-percentile male dummy is 5-foot-9-inches tall and weighs 172 pounds, giving it a body mass index that edges over slightly into the overweight category. This is hardly representative. According to the Centers for Disease Control and Prevention, almost 40 percent of Americans are obese. Research shows that obese drivers are 80 percent more likely to die in a car accident than drivers who are not overweight, making them another vulnerable population. “We don’t understand enough about the nature of obesity to know why it makes the situation worse,” Kerrigan said. As a starting point, the center’s researchers are trying to better understand the material properties of fat as a tissue and integrating that information with the human body models they use. At the same time, they are examining crash data and identifying the specific injuries that are most common to obese populations. Once the center’s researchers have a computer model that describes the response of an obese person in a crash, they will integrate it with advanced restraint systems provided by Joyson Safety Systems to explore strategies to better protect those with obesity. “We will be systematically running thousands of simulations using various restraint parameters adjustments to see if we can find a way to minimize injury risk,” Kerrigan said. The advent of autonomous vehicles is about to create another vulnerable population: passengers who recline in their seats. “Once cars are in a form of autopilot, we can expect that the occupants will spend their time reading, playing video games and even sleeping – and that means that some will recline their seats,” Kerrigan said. This is not an encouraging prospect. “The government has made it clear to the manufacturers that if they are going to allow alternative seating positions in autonomous mode, they better be prepared to protect the occupants,” Kerrigan said. Center for Applied Biomechanics researchers are collaborating with Autoliv and Honda on a series of projects designed to address this issue. One approach would be to have very strong pretensioners, which tighten the seatbelts automatically in the event of a crash. To be effective, however, the seat itself has to be relatively firm, a combination that could lead to increased risk of lumbar spine fractures. Kerrigan will conduct tests to see if this danger could be mitigated. Another issue is that standard crash test dummies are molded in a seated position and cannot recline. To find a solution for this reclining passengers, researchers will need to find a realistic way to modify these dummies. In the face of ongoing demographic and technological change, the Center for Applied Biomechanics can expect to focus on an evolving cast of vulnerable groups in coming years and, by concentrating on their specific characteristics, find better ways to reduce the human toll of highway accidents even further. “We consider ourselves fortunate to be in a profession where our overall goal is to save lives,” Kerrigan said. At the same time, he acknowledges that the intellectual challenges of developing better protection systems are compelling.